Planetary days and hours are important in the practice of astromagy. The correspondence of days and hours to planets is based on the ancient Chaldean astrological system of the order of the planets. Here is the sequence: Saturn, Jupiter, Mars, Sun, Venus, Mercury, Moon. In the magic day 24 planetary hours: 12 day and 12 night. The magic days begin with the moment of astronomical sunrise in the given place. The first planetary hour of each day begins at dawn, and the first planetary hour of the night is from the sunset. During the year, the duration of one planetary hour varies cyclically in both the large and the smaller directions. But, the principle of controlling the planetary clock always remains the same. Note that the planetary rulers are 7, and hours 12, also that the clocks of some planets are repeated during the day (or night). Also note that the first day of the day (from sunrise) is always the hour of the planet-ruler of the day. For example, on Monday the first day of the hour will always be the hour of the moon, on Tuesday - always Mars, etc. On Sundays, the first magic day of the day is dedicated to the Sun; on Monday - the Moon; Tuesday - Mars, etc. In other words, the first day of the day is always dedicated to the planet of the day itself. Next, the clocks follow in their correspondences to the normal cyclic order of the planetary spheres. So, on Sunday the second day's time belongs to Venus, the third to Mercury, the fourth to Luna, the fifth to Saturn, the sixth to Jupiter, the seventh to Mars, the eighth to Sun, the ninth to Venus, the tenth to Mercury, the eleventh to Moon, - Saturn; the first night - to Jupiter, the eighth night - to him, the tenth night - to the Sun, the twelfth night - to Mercury, and the first daytime of Monday - to the Moon, as it was predetermined. Duration of the day 01 hour 07 min. 25 sec. Duration of night hour 52 min. 27 sec. To adjust the position of the object on the map and accurately calculate the planetary day and hour, you can move the pointer, either enter the longitude and latitude in the decimal format in the appropriate fields. Knowing the planetary clocks and their properties, you can easily plan your hour of luck and find the most suitable time for transactions or global changes. 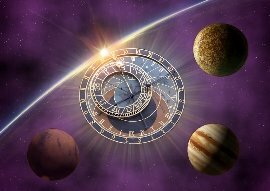 In astrology, every hour of the day is associated with one of the planets, and the planets have certain properties and energies. An hour of concentration and solitude, but also an hour of sadness, longing and reflection. It is considered unfavorable for any cases. It is recommended at this moment to stop and think about what you are doing. This hour is favorable for starting businesses that will require a lot of time, restraint and patience, as well as for dealing with Saturn people such as farmers, gardeners, miners and mine owners, real estate agents and elderly people. This is a good time to buy and sell land, buildings and general property, for the purchase of grain, coal or other products of land or mines. Time is also favorable for conducting excavation, plowing and in general agricultural activities, as well as for archaeological and geological research and everything related to antique and antiquarian things. It is unfavorable for borrowing money and for all kinds of travel and travel because of the risk of loss and disappointment. Servants and employees hired at this hour may turn out to be lazy and irresponsible workers. This time is bad for a haircut, in order to put on new clothes for the first time. This hour is unfavorable for taking medication; it is unfavorable for the sick - the illness that began at this time may prove to be protracted and serious. This hour is favorable for most purposes. This is a good time to deal with lawyers, doctors, clergy, astrologers, fortune tellers, fortune-tellers, as well as bankers, traders, property owners, grocers, and, in general, people of Jupiter. This is a good time to seek the favor of influential people, borrow and lend money, to find work. At this hour it's good to start traveling, but it's bad to board the ship. It is good for social events, banquets, joining charitable societies, Masonic lodges. You can start sowing and planting plants, but this is an unfavorable time for the purchase of animals. This hour is unfavorable for surgical operations, but the person who fell ill at this time will soon recover. This is a great time for the engagement. Public tendencies and phenomena connected with the manifestation of social activity and social ambitions are laid, as at this time we are most attuned to common interests. These hours, associated with the perception of laws, morality and religion, are considered active. This hour is unfortunate for most purposes, and especially for travel and travel. He is favorable for dealing with physicians, surgeons, dentists, chemists, engineers, military and other people controlled by Mars, as well as for work related to fire and metals, but in the latter, the danger can be hidden if Mars is damaged. It is also said that this hour is favorable for the employment of male servants, but this is only true if Mars is favorably located. At this hour it's good to start work that requires a lot of energy and energy. There are many conflicts. In these hours there are many, if not most family quarrels and scandals. This is a time of too much tension in the beginning of wars and very often the time of catastrophes. The time of the tide of energy, the hours of creativity and the manifestation of individuality, an active beginning. This hour is generally not very favorable; in general, he is good for getting promotions and contacts with influential or titled individuals and government officials. This is a bad period for the beginning of construction and for the first time to enter the house, because it threatens with quarrels and dissatisfaction; at this hour it is dangerous to get sick. At the time of the Sun, you should not wear new clothes, you do not need to spend money. This hour is bad for love, courtship and marriage. If the sun is aspected favorably, this hour is good for communicating with people and everything that the Sun controls, but if it is struck, it should be avoided. This principle is valid for all hours. This is the clock, when emotions take shape and are transformed into feelings. This time is favorable for self-esteem and reassessment of values, as well as for rest and attention switching. It is also a watch of love. This hour is extremely good for courtship and marriage, for communicating with women, or for doing things that are relevant to women. It is favorable for musical and artistic research and interests, secular affairs and for all kinds of sports, leisure, pleasures and joys. This is a good time to start traveling on land, but not on water; a good time to leave someone else's house, but a bad time to return to it. This hour is unfavorable for surgical operations, it is bad for the first time to put on new clothes, and also to start sewing. You can start sowing and planting plants. This hour is favorable for all purchases and sales in general, for writing letters, signing documents, starting studies and other Mercury cases. Favorable for contacts, information exchange, even the phone rings more often during these hours. At this time, various interesting ideas come to mind, the logical processing and synthesis of the accumulated information takes place. It is good for sowing and planting plants, for sending children to school or college, especially when Mercury makes good aspects with the Moon or Venus, but he never favors marriage. This is a good time to start a journey, but it's bad to return to your home after a long journey or trip, because it is fraught with quarrels and discontent. This is a good time to lend and borrow money, as well as for apprenticeship-related activities, especially if Mercury is in good shape with Jupiter. The hour is bad for buying houses or land, hiring a servant, organizing the release of a prisoner on bail. It is favorable for taking medications, especially when Mercury has a good aspect with Mars, Jupiter or Saturn, this is a good time to look for the location of influential people. If Mercury is weak and amazed, there is a danger of deception and fraud from other people. Therefore, during this period it is not necessary to apply for predictions to fortune tellers, oracles, as well as to specialists in European or Vedic astrology. This is a good time for courtship and marriage, for sending children to school. At this hour, you can begin the journey, but returning home from the trip, especially if it happened on the water, it is better to start at another hour. They say that this hour is favorable for communicating with enemies and opponents. The hour is good for the beginning of friendship, especially between women and in general, among the general public. A good time for hiring a servant, as well as promotional activities and opening stores, you just need to make sure that the moon is strong and well aspected. This hour is unfavorable for the purchase of animals, especially small animals, to begin construction and lending money. He is not good for taking medicines, but also for sewing clothes. Quite emotionally busy time, so often at this time the mood changes. This is a watch of high emotional receptivity and responsiveness, as a result of which we become more malleable to external influence. It is necessary to take this into account and not to yield to whims, despondency.